Manufacturer of a wide range of products which include clean room. Product Features Energy efficients, eco firendly, compact etc. Capacity / Size strat from 100 square meter. Work Location laboraties, assembly rooms, medicine manufacturing unit, food packaging etc. Our company gives out Turnkey Solution of Design Manufacture Installation to Completion. 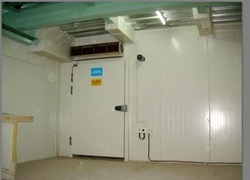 Cold rooms/ Cold storages, Factory Roof, Clean rooms, False Ceilings, Partitions, Wall Cladding, and Site Offices & Portable cabin, Industrial Buildings, Temperature Control areas Hospitals, Food Process Oven, and Laboratories etc. Pioneer India is the leading clean rooms manufacturers in India, cold rooms manufacturers in India . Looking for Clean Room ?